Probably felt like a lot longer. “There was no stand down order!” I’ve seen that a lot regarding both the book and the subsequent movie. You know, because everyone was there. But we’ll get to that later. It’s a super-fun topic. I’m reviewing this now because certain elections are in the rear-view mirror. The book is clearly meant to highlight the events and not the political tornado that followed. It doesn’t make commentary on religion; it avoids talking about Hillary Clinton. 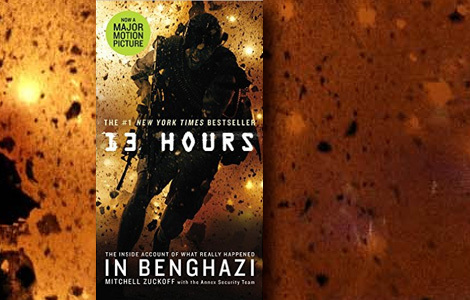 For those not in the know, 13 Hours refers to the evening of September 11, 2012, when a large, armed group stormed the United States embassy compound in Benghazi, Libya, and then attacked the not-very-secret CIA annex not far from the embassy. The story is told from the perspective of the “boots on the ground” security team that attempted to rescue the U.S. ambassador at the compound and then defended the CIA annex from attack later that same night. That’s the story in a nutshell, so I won’t go into further synopsis. What I think is important is the construction of the book. Any story, no matter how interesting the topic, fiction of non-fiction, needs something to hold you through. Usually, that’s the characters. Since 13 Hours is about a specific event, it follows a typical format: character introduction, setting of the scene, and then the event itself. 13 hours has a few things going against it. The big one being that many of the real people involved either wanted nothing to do with recounting the story (or perhaps were not allowed to be involved – CIA and all), or they wanted to keep their personal information to a minimum. That makes it hard to get to the heart of who these people are. However, I do think that is to be expected in this case, and was probably unavoidable. But it does keep the main players at arms-length. The other thing is the author’s descriptions of the security team. “They knew their training was the best and would give the best chance to be their manly best.” That’s an exaggeration, of course, but there are several such generic passages in this book. Maybe that’s what the author got during his interviews with the security team, I don’t know. This is where it gets interesting. If anyone really comes to life here, it’s Ambassador Stephens. In a short span, you really get the sense of who he is and why he was there, even why he made some of the decisions he did. The story needed this and it got it. Benghazi itself gets in-depth treatment as well, which helps clarify the ensuing tale. There is a lot of speculation on why it all happened in the first place, but these details about the city lend a real understanding, even if your understanding might defer from the next reader’s. This is the main thrust of the book. Similar to the movie, this is where the narrative takes off. The story pretty much writes itself here, but the author is able to put it into clearer perspective than the he did with the character introductions. He doesn’t embellish (or at least not nearly as much as he could), and he doesn’t make political judgments. He effectively illustrates the fear and confusion of the prolonged rescue attempt and defense of the annex. The confusion, the complete lack of knowledge of what the security team was running into, is what makes the tale so harrowing. This is truly an account of these selected individuals in the heat of the moment. Nothing more, nothing less. That’s the big problem a lot of readers/movie-goers had. I don’t think they wanted to trust the hired guns (trusting the CIA is, apparently, much easier). Going back to the “there was no stand down order,” strange political lines were drawn around that part of the story. I can’t help but wonder why people were so fixated on that. If you read this book, I think you would find that a “stand down” order would have made perfect sense under the circumstances. Especially since there were known protocols in place regarding the local militias. It seems like the security team would have no reason to lie about it and the CIA would have no reason to deny it. Maybe I’m just stupid and I don’t get it. Anyway, I think 13 Hours a story well worth reading. It’s pretty darn good. Still, I wanted a main character to latch onto, or I would have liked the author to interject his own conclusions. Isn’t that why we read? To get someone else’s perspective?